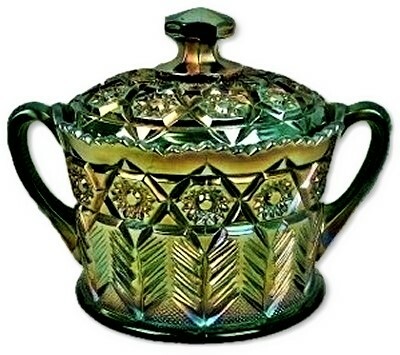 Vintage carnival glass is molded or pressed glass, always with a pattern and always with a shiny, metallic, 'iridescent' surface shimmer. Both functional and ornamental objects were produced in the carnival finish and patterns ranged from simple through geometric and 'cut' styles to pictorial and figurative. A wide range of colors and color combinations were used but the most common colors accounted for a large proportion of output, so scarce colors can today command very high prices on the collector market. 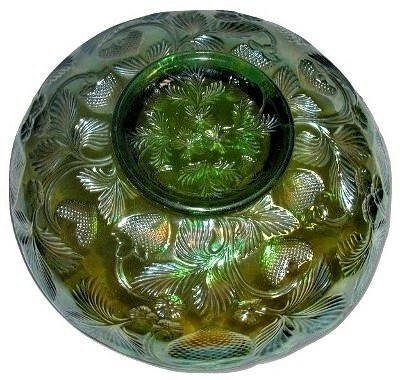 Carnival glass has been known by many other names in the past: aurora glass, dope glass, rainbow glass, taffeta glass, and disparagingly as 'poor man's Tiffany'. Its current name was adopted by collectors in the 1950s from the fact that it was sometimes given as prizes at carnivals, fetes & fairgrounds. However, that can be misleading as people tend to think that all of it was distributed in this way but evidence suggests that the vast majority of it was purchased by the housewife to brighten up the home at a time when only the well off could afford bright electric lighting. Green INVERTED FEATHER 2 handled cracker jar and lid. 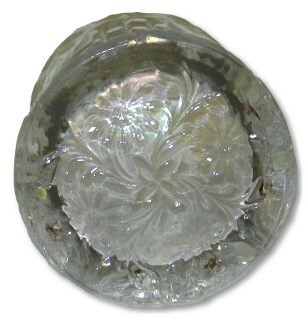 This item is part of the Near Cut line produced by Cambridge Glass Company and it is unmarked. Measures 6 3/8" high and 8 1/4" across from handle to handle. The interior rim has a very tiny flea bite and the lid has an in the making small open bubble on the very seam edge of the lid, unseen when the lid is in place. No chips, cracks or repairs other than the above mentioned flea bite. Green Near Cut Inverted Strawberry bowl. This item is marked with the raised Near Cut for the Cambridge Glass Company. 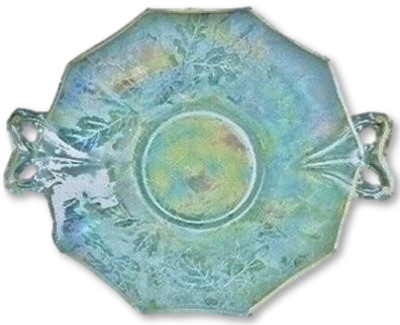 A scarce item with exceptional radium finish3 Measures 6 1/2" X 2". There is one extremely tiny pin prick sized flea bite flake. No chips, cracks or repairs. 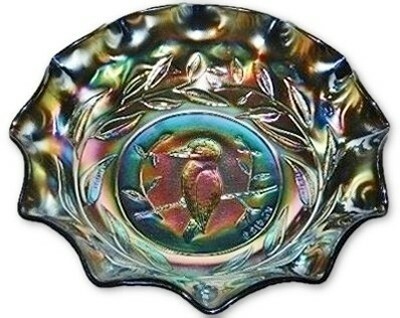 CROWN CRYSTAL (AUSTRALIAN) KINGFISHER large ruffled black amethyst bowl. Measures 9 1/4" X 2 3/4". Factory ground and polished foot rim. Light use wear to the interior ruffles and a few in the making grinding flakes on the base rim. No chips, cracks or repairs. FOSTORIA ice blue BROCADED ACORNS 2 handled octagon bowl. 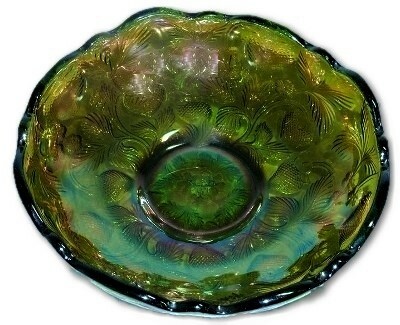 Low relief pattern of acorns and oak leaves cover the majority of the surface of this bowl. 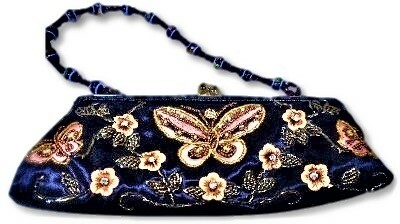 The applied original Gold enamel is @ 95% intact. Measuring 7 1/2" across at the widest point and sitting 1 3/8" high. No chips, cracks or repairs. 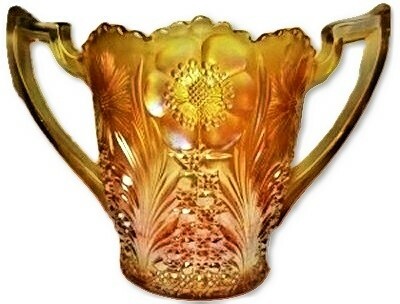 Matthew Turnbull England (attributed by Steve & Glen Thistlewood) amber TOWERS vase & non iridized flower frog insert. Measures 3" tall and 4 3/4" across the top. No chips, cracks or repairs. 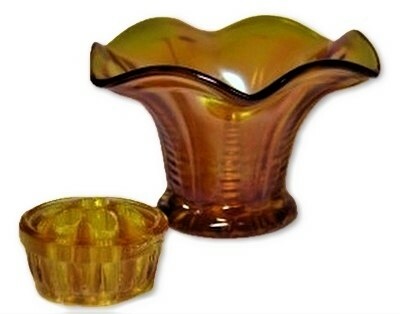 U.S. GLASS honey amber COSMOS and CANE 2 handled spooner. Measures 6 1/2" X 4 3/4" X 4". No chips, cracks or repairs. 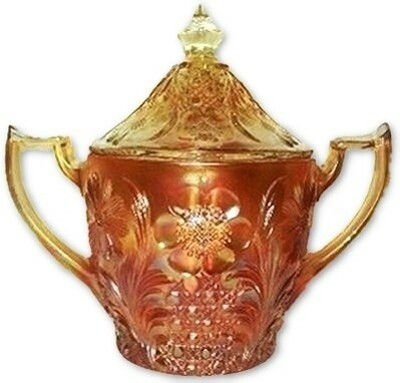 U.S. GLASS honey amber COSMOS and CANE 2 handled covered sugar. Measures 7 1/4" X 7" X 4 1/4". The lid appears to be a bit loose fitting on the base of the sugar yet we know that this is the correct shape and pattern match for both top and bottom. No chips, cracks or repairs. White U.S. GLASS Cosmos and Cane tumbler. 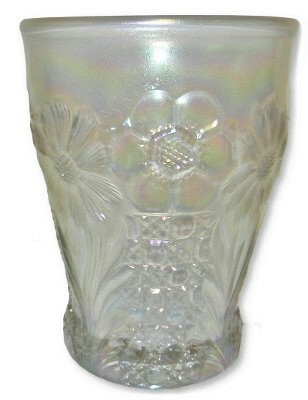 The beautiful soft iridescent finish covers slightly grey/lavender glass as this pattern is known to be found. Measures 4" X 3 1/8". No chips, cracks or repairs.